Przewalski horse in Berlin Zoo. On 23 February 2018 an international group of paleogeneticists and zooarchaeologists studying horse domestication published a report in the journal Science. They had recovered and sequenced DNA from the remains of horses found at the Botai site, hoping, as team-member Ludovico Orlando put it, “to catch evolution red-handed, when domestication first started.” Instead, they turned our understanding of domestication, of the wild and the feral, upside down. The Botai horses did not appear to be the ancestors of today’s domestic horses. They were the ancestors of the Przewalski. Our sacred wild Takhi was, like the mustangs, the brumbies and the New Forest ponies, feral – an escapee from the Botai’s Copper Age corrals. Very like the wild horses on cave walls with their upright manes and dun coats, but taller and tamed. Either so many other wild horses had been added to the gene pool since the Botai vanished that the Przewalski DNA had been erased, or domestication had happened in other places, with other ghost horse herds. All two thousand of our last surviving wild horses disappeared overnight. Thinking back to Hustai and everything that led to the rewilding of those 121,000 acres of steppe, to the airlifts, the complicated breeding programme, the conferences, studies, rangers, scientists, grants and zookeepers, I thought only what a beautiful irony we’d created. After all that the horse had done for humanity, we’d thrown the world’s resources into returning the earliest horse who’d known a bridle and a fence to a landscape with neither bridles nor fences. The Takhi was tamed, and we had insisted that he become wild once more. “Ancient genomes revisit the ancestry of domestic and Przewalski’s horses” by C Gaunitz et al. Science, 22 February, 2018. “Ancient DNA upends the horse family tree” by Elizabeth Pennisi. Science, 22 February, 2018. “Surprising new study redraws family tree of domesticated and ‘wild’ horses” by University of Kansas. Phys.org, 22 February 2018. I’ve written something for The Atlantic‘s Object Lessons blog on the long (if potted!) history of horsemeat in America. A much fuller account is on offer in The Age of the Horse! During World War II food shortages, horse meat once again found its way to American tables, but the post-war backlash was rapid. “Horse meat” became a political insult. “You don’t want your administration to be known as a horse meat administration, do you?” the former New York Mayor Fiorello La Guardia demanded of his successor William O’Dwyer. President Truman was nicknamed “Horse meat Harry” by Republicans during food shortages in the run up to the 1948 “Beefsteak Election.” In 1951, reporters asked if there would be a “Horse meat Congress,” one “that put the old gray mare on the family dinner table.” When Adlai Stevenson ran for president in 1952, he was also taunted as “Horse meat Adlai” thanks to a Mafia scam uncovered in Illinois when he was governor. The Trump budget cut isn’t well thought through. Firstly, there are no slaughter houses in the US processing horses for meat, and recent attempts to open new abattoirs have resulted in passionate local protests. Secondly, the horses could go to Mexico or Canada, but both countries are obliged to keep horses for six months before slaughter to ensure there’s no drug residue in their meat if they want to sell to Europe (and horsemeat exports from Mexico have long been suspended in Europe). This makes horsemeat a lot more expensive to produce. A Canadian plant has already closed as a result of this requirement. So who would slaughter these mustangs? Montana must exterminate its wild horse herds. Washington dispatches carry discouraging news for those who hope to see the Montana wild horse converted into meat for hungry Europe. American commercial attaches have forwarded from France and Belgium to the American capital data indicating that the expected market does not exist. In the first place, the people will not eat frozen horsemeat. In the second place, horses consigned to the butcher must be slaughtere, within the cities or districts in which they are to be consumed. The Montana plan contemplated slaughter at some point in the state, with sale of the bi-products [sic] in America. It had always been supposed that a ready market for the meat would be found abroad. There is still another plan – to render the wild horse for his products and sell the meat for fertiliser. This, it is said, it may prove feasible. The wild horse has been a problem in the state for some years. The animals number hundreds of thousands and consume a vast amount of range. There is not profit in rounding up the beasts, since they cannot be sold, except a rare few. Hunting them, as well, is no child’s play. They are fleet and wary and the hunter on a horse has little chance to overtake them. Yet the beasts must go. Stockmen are determined on that. The matter was recently discussed in the state convention of the stockmens association and it was stated that tremendous herds of cattle and sheep could be maintained on the grass the world horses eat. The beasts probably are descendants of Indian horses. They are of the poorest stock and are difficult to domesticate and almost worthless when tamed. They travel in bands and are formidable fighters with tooth and hoof, when aroused or cornered. 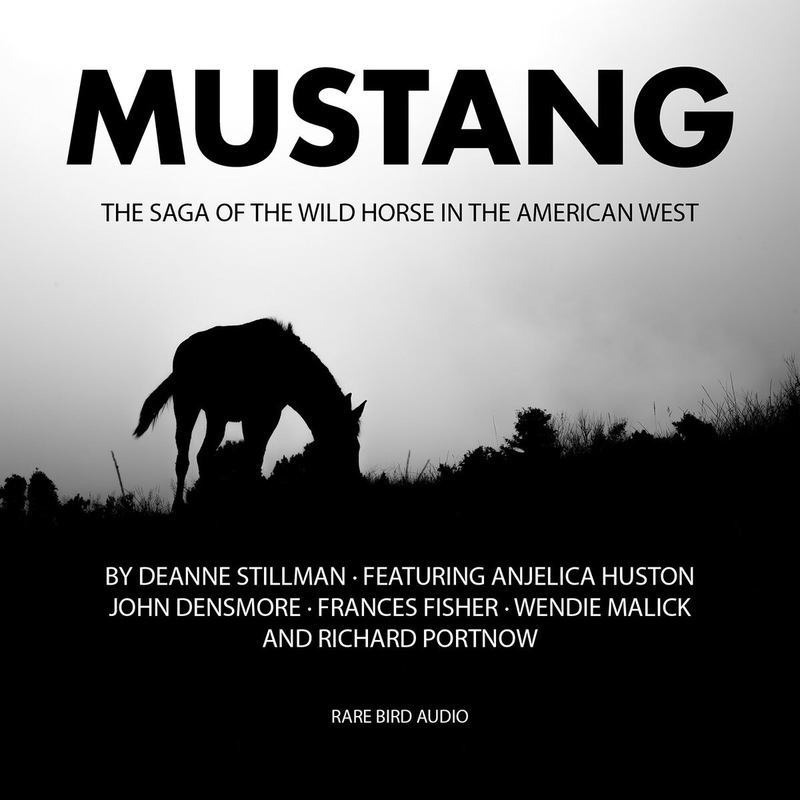 Deanne Stillman’s Mustang: The Saga of the Wild Horse in the American West came out in 2008 and remains definitive. It takes you from the arrival of the first Conquistadors’ horses – like Pedro de Alvarado’s “bright bay mare” “good both for tilting and to race” and the grey “Bobtail” who was “fast, and had a splendid mouth” – to the politicking of the Bush years when America’s wild horses once more came under threat. It will give you some pointers about their fate in the next four years, too. Her next book, Blood Brothers, flows out of it and tells the story of Sitting Bull and Buffalo Bill. Simon and Schuster will publish in the autumn. Those of you who like books but have to fit them into a life that includes school runs, commutes, housework, an exercise schedule and/or poo-picking might be interested in the audio version of Mustang. It features the voices of Anjelica Huston, Frances Fisher, Wendie Malick, Richard Portnow and John Densmore. While wild horses in the right environment can blend beautifully into their background, the better to fool predators, it’s another story with domestic horses – especially those pressed into service in battle. The Camoupedia is a blog dedicated to the art of becoming invisible. Fascinatingly, it includes three posts about the camouflaging of horses in World War One – one about the French painting their horses khaki, and another about US soldiers in Mexico in 1915 grubbing up their favourite grey, while British troops in East Africa liked to transform their mules and ponies into zebras. And to flip the concept around, here are US snipers using a papier mâché “dead horse” to take a pop at the Hun. 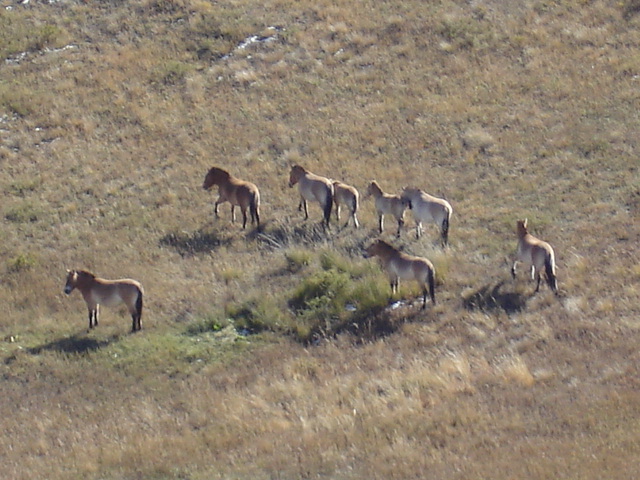 Takhi or Przewalski horses in Hustai National Park, Mongolia. Putting some space between themselves and the people with clipboards and cameras.